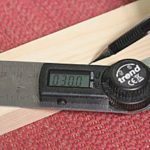 Accurate marking and setting out is the basis for successful woodwork, and more and more of the old type gauges are being replaced with digital versions. 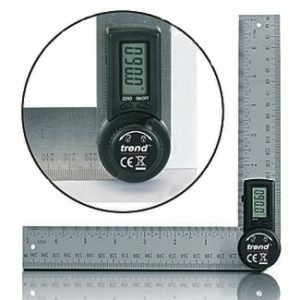 One of the latest is the Trend 200mm digital angle rule DAR/200. The rule consists of two stainless steel blades, each 200mm long, which are pivoted at one end to open out into a 400mm rule marked in both metric and imperial scales. At the pivot point, a plastic housing contains a digital display unit for angles, and the battery (CR2032 3V) that powers it. A locking knob holds the blades in any set position. 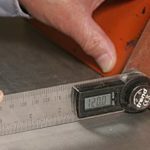 Although the rule has marked scales along its length, it is likely to find more use measuring angles and is quite likely to make your sliding bevel redundant. To measure an angle, the locking button is freed by rotating anticlockwise and the blades opened to a pre-determined angle or against the item being measured. The blades are then locked by a clockwise turn of the locking button. 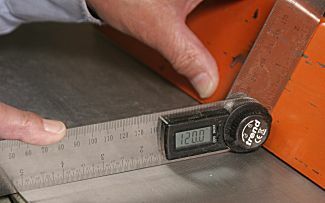 An accuracy of 0.3° is claimed for the rule, which could dramatically improve the accuracy of segmented work, where the cumulative error can easily build up. A zero button allows the readout to be zeroed at any angle, which adds to the versatility of the rule. 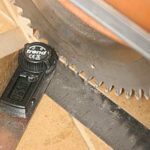 For example, to set the angle of a planer fence for bevelled cuts, the rule is placed closed on the planer table, the scale zeroed and the rule opened to the required angle for the cut. 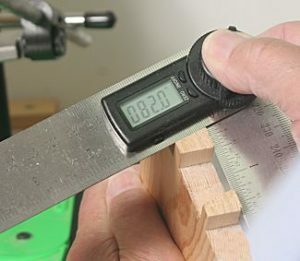 Other obvious uses of the rule include checking the angle of mitre or radial arm sawcuts, and measuring the angle of a dovetail component. With practice, various tricks for zeroing will suggest themselves. For example, in Pic 6 the angle of the cut is 8°, but is shown in the picture as 82°, i.e. 90° minus 8°. 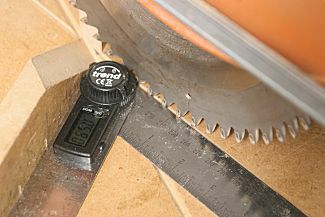 The rule could have been set to 90° and zeroed before aligning the blades on the cut. The displayed value would then have been 8°. In other words, you can decide the base line from which you start measuring the angle. This is undoubtedly a piece of kit that will find more uses as you get to know it. 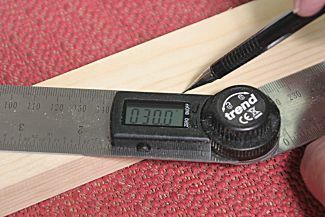 I shall not throw away my 90° engineer’s square or 45° mitre gauge, because they are simple, accurate and not liable to battery failure, but for all sorts of other angular laying out, setting, and measuring, this digital device will come into its own. It comes complete with battery and has a 6-minute auto-shutoff, if the blades have not been moved in that time.